Wintergreen leaves were used traditionally as a pain reliever, is an old native American remedy for the aches and pains of arthritis sore joints and rheumatism, and an aid to breathing while hunting or carrying heavy loads. Its aspirin-like qualities also help to relieve headaches, toothaches, muscle inflammation and painful joints, carpal tunnel syndrome and colds. As an astringent, it helps to control diarrhea and excess mucous discharges. It also indirectly helps to alleviate soreness of joints and muscles. Wintergreen a warming herb and a tonic that mildly stimulates circulation and the digestive tract. It is considered a "carminative" because it is considered effective in easing gas in the bowels and is also helpful in cases of colic and general stomach trouble. As a diuretic, it promotes the production and flow of urine, and with its antiseptic qualities, it is believed to be good for urinary, prostate and kidney ailments, as well as all bladder complaints. In larger doses, the herb acts as an emetic and can produce vomiting. Wintergreen is also said to be helpful in relieving scrofula, the swelling of the lymph nodes of the neck. Wintergreen also stimulates suppressed menstruation and regulates its flow. And it is thought to relieve the pain and headaches associated with menstruation. 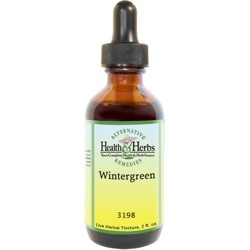 When used externally, Wintergreen is an excellent anti-inflammatory and relieves the pain of rheumatism, arthritis, sciatica, myalgia, sprains, and neuralgia, but use cautiously, as it is very strong and can cause irritation. Its antiseptic qualities have made it effective in easing a sore throat and sore mouth, and it has also been used for gonorrhea and as a douche for leucorrhoea. Ingredients: Wintergreen Leaf, Structured Water, 20% Alcohol. Non-Alcohol: Wintergreen Leaf, Structured Water, Vegetable Glycerin. Contraindications: Wintergreen should not be taken by people who are hypersensitive to salicylates (aspirin). Those who take warfarin (Coumadin) or any prescription blood-thinning medications should not use Wintergreen. The oil should never be ingested (it is meant for external use only), and because it is so easily absorbed through the skin, it can become toxic to the kidneys and liver if used for more than three days a month. Do not use Wintergreen is you suffer from acid reflux (GERD) problems.